Gold advances to fresh daily highs breaking above the $1220 handle and reaching the $1224 level. Despite the New York Fed President Williams stating yesterday that the Fed will continue with its gradual rate increases, this comment failed to help the greenback gather strength against its rivals. In addition to the Dollar weakness, the shift to safety during the NA session yesterday helped the yellow metal find some demand with the three major equity indexes in the U.S. losing between 1.7% and 3% on the day. 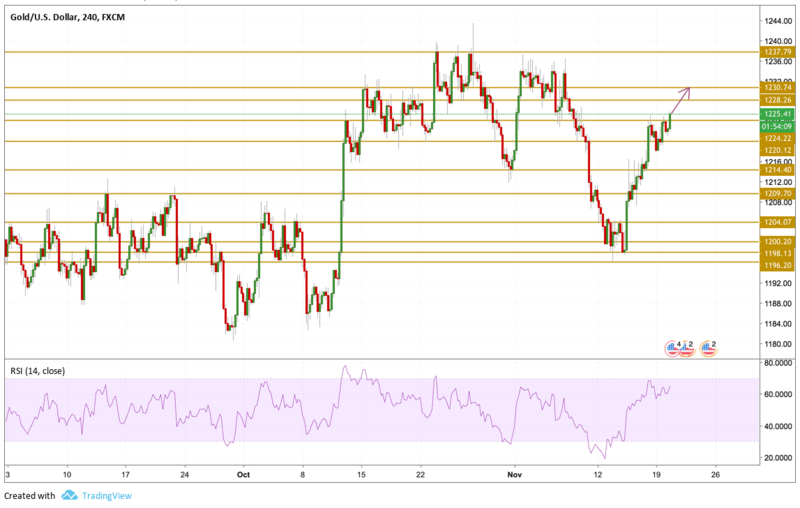 Gold price broke above the $1224.22 resistance level after gaining some traction followed by a strong momentum. The price is currently hovering just below the $1225.5 level with a bullish momentum as we can see on the RSI. The next level we will be watching is the $1228.26 level but most importantly the focus will be on the $1230 level.